The holidays are a little brighter for many charitable organizations in Fort Bend County thanks to a successful 2017 Sugar Plum Market. Presented by the Fort Bend Junior Service League (FBJSL) and Memorial Hermann, the 17th Annual Market raised $280,000. 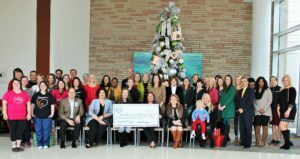 Those proceeds were presented to Fort Bend County charities on December 15th at a Check Presentation Party held at Memorial Hermann Sugar Land. The following beneficiaries each received a portion of event funds: AccessHealth; The Arc of Fort Bend County; Boys and Girls Club of Greater Houston; Brookwood Community; Catholic Charities; Child Advocates of Fort Bend; Clothed by Faith; East Fort Bend Human Needs Ministry; First Tee of Greater Houston; Fort Bend Children’s Discovery Center; Fort Bend County Women’s Center; Fort Bend Family Promise; Fort Bend Habitat for Humanity; Gigi’s Playhouse; Hope for Three; Houston Museum of Natural Science at Sugar Land; Literacy Council of Fort Bend County; Lunches of Love; Parks Youth Ranch; Rainbow Room, SIRE; Texana Center; Reining Strength Therapeutic Horsemanship; The Rose; and Fort Bend Junior Service League’s Community Assistance Fund. This year’s “Believe in The Magic” themed Sugar Plum Market focused on the amazing beneficiaries who have received grants from event proceeds through the years. Since its inception in 2001, the Sugar Plum Market has raised more than $2,400,000 for numerous local charities. The popular holiday shopping event continues to grow, and this year welcomed 7,000 attendees and over 100 unique vendors. Photos from the 2017 Market may be viewed on the Sugar Plum Market Facebook page. For more information about the Sugar Plum Market or FBJSL, please visit www.sugarplummarket.com or www.fbjsl.org. Photo: Representatives of the organizations receiving proceeds from the 2017 Sugar Plum Market joined members of FBJSL and representatives of Memorial Hermann on December 15th to celebrate the Market’s success.